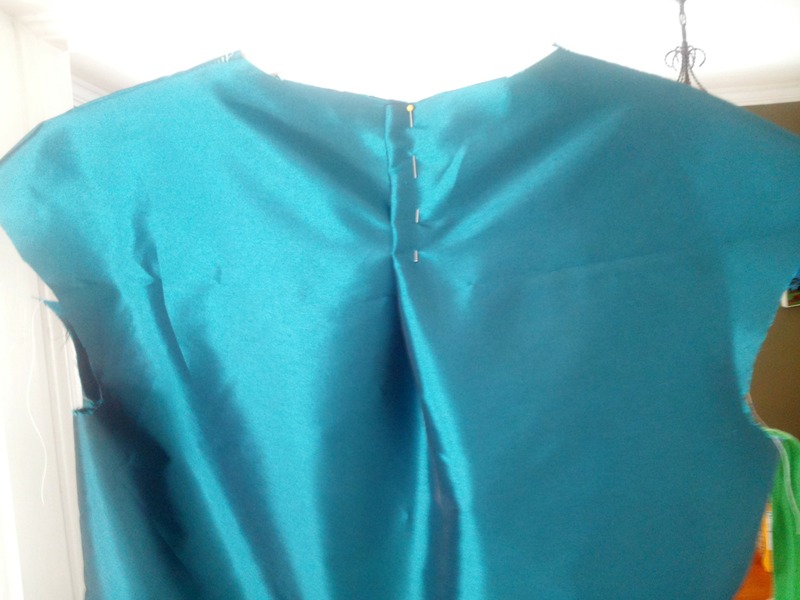 I’m back working on the Burda panel dress from the May magazine again. I got so inspired by the idea of adding leather (faux, at least) as the middle panel that I went back to the traced pattern to start in on alterations. 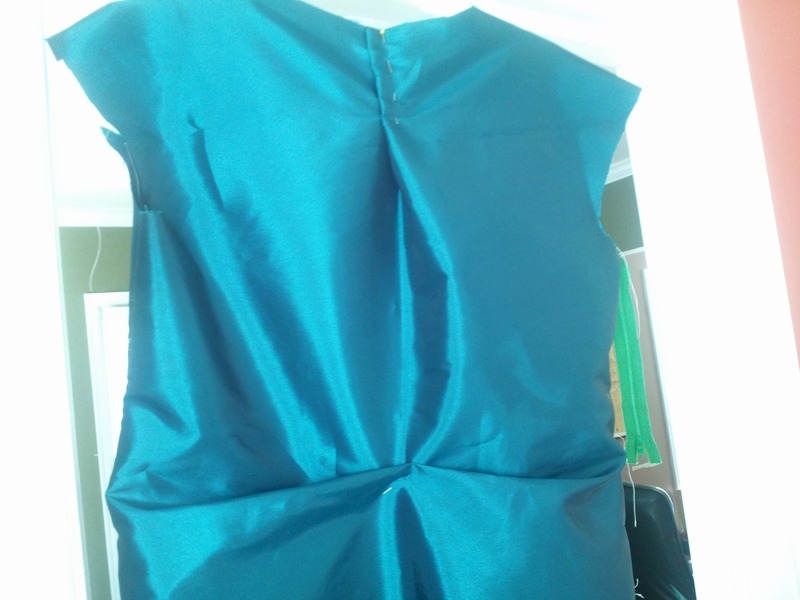 I did the FBA already but I still have to fix the curved seams in the front. This muslin is made in poly taffeta. What I’m here to show you is the back because this is where I had to make a big adjustment. After the fit failure from the Portrait Blouse, I started thinking about my back. Those drape lines in the pictures above are there because that’s how much I had to pinch out of the back! I seriously need to figure out a better size to start with for the back. The horizontal tuck is a normal alteration for me and, really, the upper back alteration I do a lot, too, but often forget about it until I get pictures taken. I’m finally waking up about my back needing a different size. Do you use a completely different size for your front compared to your back? I’m no expert in this department (I’m more of a knitter) but I’m sending over some sewing luck to you! I’m going to take the muslin apart and I’ll see what size I get from the altered back. I’m very curious, too. A sewing friend suggested it. I would guess that because of your bust size that you possibly start with a larger size than you actually are for your torso and then make your FBA (because most patterns are actually sized more for a B cup). Perhaps you are really a smaller size than you think all around. I know that when it comes to patterning for pregnancy, the back is the one area that doesn’t change much in size or shape, so the standards for back patterns are probably more general across the board for everyone. And I came across this interesting article about bra sizing & grading the other day (most of the website is only for paying subscribers, but this info is free). Take a look specifically at the “cross grading chart” in the middle of the article – this may be what you are running into. You might need to pick your pattern size based on something like waist measurement (instead of bust) and then do your FBA from there. Oh, Brooke! Thanks for the comment. I’m finally ready to understand this. Yay! This makes so much sense. And I think you’re exactly right. My underbust is a mere 33 inches and I’m going off my high bust which is about 37″ and then my full bust is 42.5″, so yeah. 🙂 I’m going to take a picture of the back alteration. This is getting interesting.